Walking tours are very popular in Vancouver but there’s a very special tour coming to Surrey for the holidays. 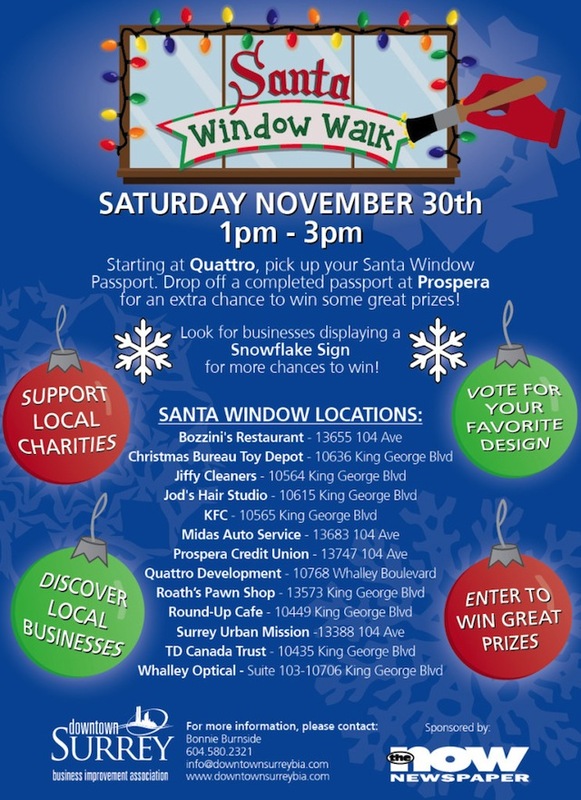 On Saturday, November 30, 2013 the Downtown Surrey Business Improvement Association is hosting the Santa Window Walk. This free community event will connect local businesses, charities/non-profits, and high school art students for an afternoon of music, cheer, and holiday spirit. The walk will encompass over 14 Christmas designs on window spaces donated by participating businesses including Bozzini’s Restaurant, Jiffy Cleaners, Surrey Christmas Bureau Toy Depot at the Dell Shopping Centre, TD Bank, KFC, SUM Place, Jod’s Hair Salon, Whalley Optical, Roath’s Pawn Shop, Midas, and Round-up Café. Organizations will be placed in front of their respective window, painted by local high school students, and encourage the community to donate towards their cause by caroling, selling hot chocolate or painting faces by donation. Groups include the Surrey Christmas Bureau, Surrey Food Bank, Centre for Child Development, Sophie’s Place, Surrey Urban Mission, Nightshift Street Ministries, Arts Umbrella, RCMP Youth Division, KidSport, Whalley Scouts, Surrey Hospice, Kinsmen Lodge, Surrey Memorial Hospital Foundation and the North Surrey Lions Club. The window generating the highest amount will receive a cash award – one for the artists and one for the charity. In addition to businesses with painted windows, “Snowflake Stops” (stores displaying a snowflake sticker) will be open to participants who can stop by and pick up an entry form to win a gift basket generously donated by local businesses. Draws will take place at Prospera Credit Union on November 30th at 2:55pm. The tour ends at Prospera Credit Union (104 Ave at Whalley Blvd) and both the starting point and the final location are within walking distance of either Gateway or Surrey City Centre SkyTrain stations. I grew up in this neighbourhood and I think it’s fantastic to have an opportunity like this, to invite everyone to the community to see what it’s all about. Follow the Downtown Surrey Business Improvement Association on Facebook and Twitter for more information.